Yes, I must literally be crazy. Welcome to Day 1 of the 31 Day Challenge. If you've been around here for a while, you'll remember I have done this in September of 2011 and 2012 with some of my amazing nail friends such as Sarah of Chalkboard Nails. Clearly Sarah and I cannot let each other down so we are doing it again. A lot of other people around the nail world are doing it, too. Be prepared to be flooded each day with challenge posts. Who can make it to the end?! The theme for Day 1 is Red. You may know that I have a new obsession with lipstick, so when thinking of red, all I could think of was red lips. Specifically RiRi Woo, my amazing new matte red lipstick from Rihanna's collaboration with MAC. Thought it would be a good time to bust out my lips-and-lipstick print from Bundle Monster plate BM-303! I used the same red that I used in last year's red mani... How predictable. It's OPI - Comet Loves Cupid, my most favorite red creme. The formula is wonderful, 2 coats, and no staining! But HOLY CRAP it is hard to photograph your face and be happy with the results! Peach fuzz... Dry skin... Tiny lips... What!! How do you beauty bloggers post your faces every day without being like OMFGZ MY PORES?!?! I suppose I'll stick to nails... Unless there's like a resounding YES in the comments of this post regarding other beauty things. But hey. It's all good. Can you guys believe I am doing this challenge again? I can't. I really can't. Haha! 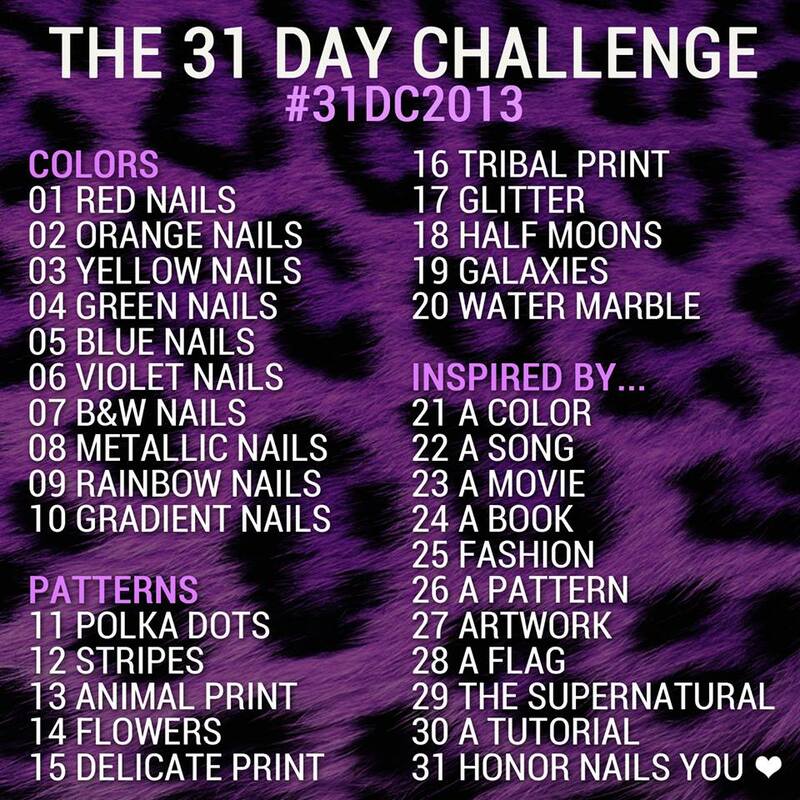 Here's a refresher of the daily themes, photo credited to the lovely Chalkboard Nails of course. this red looks great on you! This is beautiful! And that red polish is amazing! Everythingis gorgeous etc. etc. etc. but YES I TOTALLY AGREE WITH YOU. I've tried to take pictures of my lipstick or whatever a few times but it always ends up like 'Oh hi! Please enjoy looking up my nostrils!' haha. No. I don't understand how others manage to look so classy.